Many ambulance providers operate both advanced life support (ALS) and basic life support (BLS) ambulances. 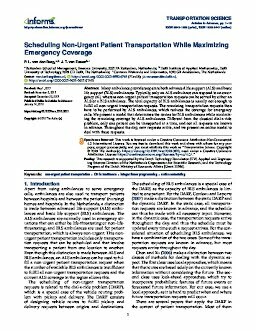 Typically, only an ALS ambulance can respond to an emergency call, whereas non-urgent patient transportation requests can either be served by an ALS or a BLS ambulance. The total capacity of BLS ambulances is usually not enough to fulfill all non-urgent transportation requests. The remaining transportation requests then have to be performed by ALS ambulances, which reduces the coverage for emergency calls. We present a model that determines the routes for BLS ambulances while maximizing the remaining coverage by ALS ambulances. Different from the classical Dial-A-Ride Problem, only one patient can be transported at a time and not all request are known in advance. Throughout the day, new requests arrive and we present an online model to deal with these requests.